Pauling's protein work was strongly influenced by a number of researchers, Astbury, Landsteiner, and Wrinch (in a negative way) among them. 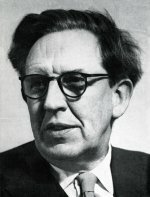 But none was more important than the British crystallographer John Desmond Bernal, a genius whose colleagues nicknamed, affectionately, "Sage." Bernal was a specialist in studying the most difficult, delicate proteins known. Globular proteins were very different from the keratin fibers that Astbury studied. Globular proteins dispersed in liquids, like antibodies in blood plasma, and enzymes in the interiors of cells. For years, most researchers thought that globular proteins were impossible to study with x-rays, because no matter how carefully they were treated, no one could get a decent pattern. They were hard to purify and seemingly impossible to crystallize. Some chemists theorized that globular proteins had no regular structure at all, but were more or less random aggregates of amino acids that, in the body, might be used to help orient other molecules like vitamins and hormones. Bernal proved them wrong. In 1934 he showed that globular proteins were like jellyfish: They needed a liquid environment to retain their structure. When dried, they collapsed. By x-raying them in their "wet" form, Bernal could get usable patterns, indicating a defined structure. By the late 1930s, he had built a dynamic team of researchers dedicated to cracking the structure of globular proteins, regardless of their huge size and apparent complexity. He and his coworkers, including Dorothy Crowfoot and Max Perutz, worked with insulin, hemoglobin, chymotrypsin and other globular proteins. They found that their targets had a definite size and shape, and that they were terrifically complicated, more so even than keratin – so much so that Pauling, when he saw their patterns, thought that it would take decades to solve any one of them completely – if it was possible at all. By the late 1930s the world of protein structures had begun to revolve around three centers: Bernal's lab in Cambridge, Astbury's at Leeds, and Pauling's at Caltech. The British researchers were taking the same general approach, working directly from the analysis of x-ray patterns, trying to build a picture of protein structure from the extraordinarily complicated patterns they were becoming ever-more expert at obtaining. Pauling, by contrast, was working from the work the British published, his understanding of the chemical bond, Corey's research on amino acids, and model building. Each group carefully tracked the others. See Also: "Bernal's Contributions to Structural Chemistry." November 18, 1971. 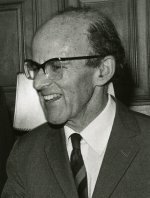 Portrait of Max Perutz. April 6, 1976.